Pakoda or Pakora is all time favorite Indian Snack item. They will be served in every small gathering. They are the best munching snack. The main ingredient in them is besan or chickpea flour, added with some greens, onions and chillies. A little bit of rice flour may be added to it to get more crispier. Kids and elder love them alike, I do not see not even a single person who do not love them, but for health reason some may take less number of them. Discard the leaves from the stems and chop them finely. Wash them under running water. Chop coriander leaves and wash them also under running water. In a wide bowl, add all the ingredients except oil. Mix them well. Fenugreek leaves have bitter taste, those who do not like the taste can add more aamchur powder. We in my house love the original taste of it, bitterness so I added little of aamchur powder. While adding the greens squeeze out the excess water and then add. Add water if necessary and make dough out of it. Heat oil in a kadai, drop small portion of dumplings in it. Fry them in low flame. Otherwise they may burn outside and inside do not cook. Once they turn into light brown shade drop them onto a paper napkin to drain out excess oil. 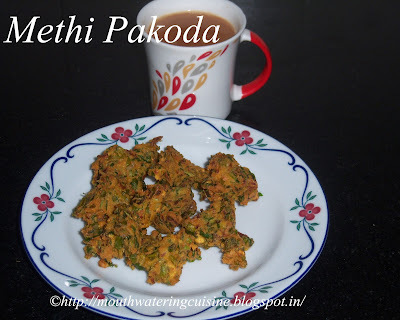 Serve hot methi pakoda with nice fflavorful tea in the evening.